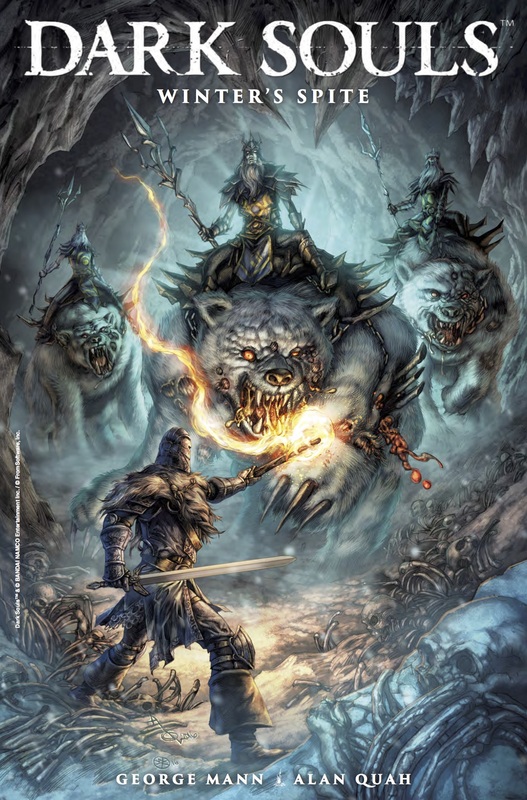 Winter’s Spite issue 3 marks a distinct change in the storytelling of not only this series, but the Dark Souls comics in general. And boy is it good. This issue is, for the most part, story based. That’s not to say that the series has been story-less up until this point, as that’s definitely not the case. Rather, this instalment spends a lot of time answering questions, building tension and, indeed, raising more questions again. We pick up with Andred back in captivity. However, this time he is subject to Duke Etinger’s whim. 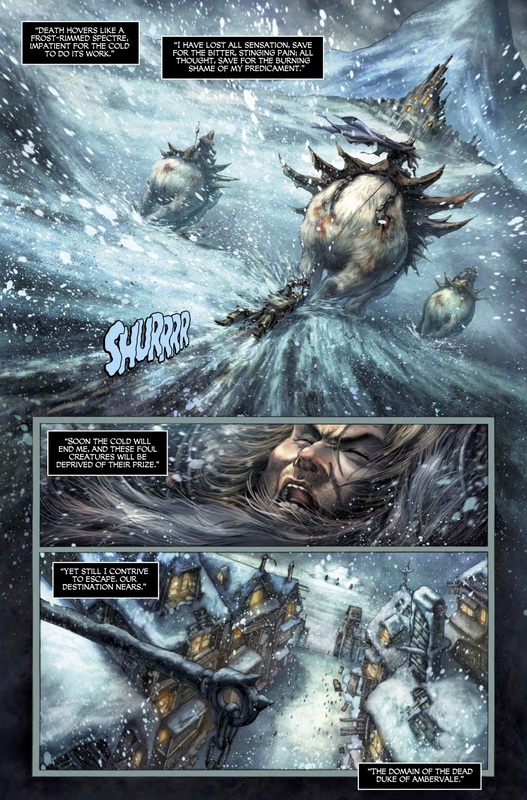 In a spectacular scene, Andred is dragged behind a polar bear mount, through the snow-covered wasteland, to Ambervale – the miserable domain over which the Duke rules. It is revealed the undead curse has impacted this town horrifically. Both its human and animal inhabitants have been transformed into ‘twisted parodies’ of what they once were. his guest. Our protagonist, being well versed by now in the ways of treachery, sees through this lie, recognising full well that he is a prisoner. The Duke insists that Andred is desired by Parnethia – a beautiful women who rules as goddess over the icy wilderness. The Duke then narrates the story of Parnethia’s love and the undead curse, revealing that she, alone, possesses the power to cure the curse that plagues his land. As payment she desires the warrior that crosses the land to murder her. The Duke believes that Andred is this warrior. Of course, Andred is not. If we remember back to the previous issue, Andred was drawn to safety by Parnethia’s apparition. His sole duty is to recover his heirloom from the nameless knight. And so, Andred attacks the Duke, only to be quickly struck down. And as Andred works on escaping, once again from imprisonment, the series reverts to its usual gritty, violent approach. middle of a ball, the two do battle. Carnage ensues as does one of the series’ most memorable battle sequences. But Andred is unable to defeat the Duke, and instead makes a cunning escape. He battles through the frozen wilderness assuring us that the Duke will pursue. 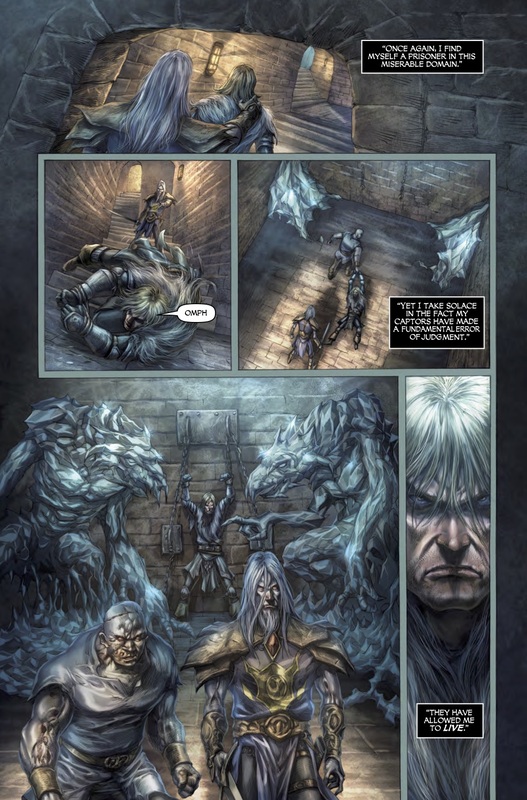 The comic ends with Andred standing at the entrance of Parnethia’s tower, revealing to us that the warrior who means to slay her is the same warrior he, himself, so fervently pursues. It seems that the Winter’s Spite series just keeps increasing in quality as it goes on. Andred’s story has proven to be both nuanced and interesting. And the addition of this twist has raised the stakes and displayed sophistication in storytelling that the series has lacked up until this point. I can only hope that the next issue follows suit.